This is what I am doing with my day. What are you doing with yours? I am offering a portrait special for Xmas, if anyone out there is interested please visit my site. 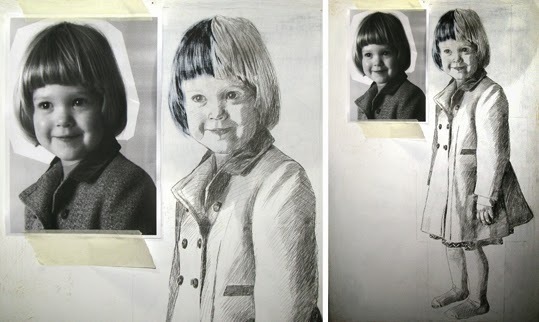 These are the beginning stages of a wee portrait I am doing for my sister. I have drawn Eloise on in pencil and have just started to work her hair in using sandpaper to sand off the top layer of the Gesso to reveal the dark Gesso beneath. I will update you as it goes. I would love to paint Alice - she has the most beautiful face! We must try and sort out a good photo that I can work from.